For a presentation on a computer, you want to ensure that it always comes to a defined initial condition with an automatically signed-in user account even in case of a restart. Even in case of automatic log-in, it is usually possible to divert the process by pressing [Shift] if you want to log in with another user name. 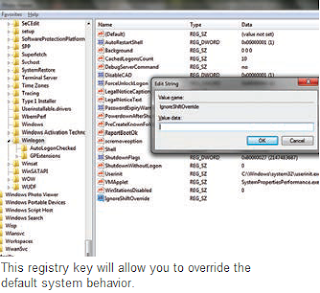 This method can be effectively blocked with the help of a small registry input. Open the command ‘Run’ in the start menu, then enter ‘regedit’, or in case of Vista or higher version enter it directly in the search field, and press [Enter]. Confirm the user account control query with ‘Next’ or ‘Yes’ depending on the system. In the registry, navigate to the key ‘HKEY_LOCAL_MACHINE\SOFTWARE\Microsoft\Windows NT\Current Version\Winlogon’. Then click in the right part of the window and open the command ‘Edit | New | Character String’. Enter ‘IgnoreShiftOverride’ as the name and confirm with Enter. Double click the new entry and open it for editing. Then change its ‘Value’ to ‘1’ and confirm with ‘OK’. Close the registry. Logging in to another user account via [Shift] during the start process will no longer be possible. Set the newly created registry value to ‘0’ or delete it in order to restore the default settings later.